The Panzerkampfwagen VI Tiger Ausf E might be an obvious choice, but it’s such an iconic vehicle that I decided it deserved a place. The Tiger was developed in response to Soviet tank designs such as the T-34 and KV-1, which took the Germans by surprise when they invaded in 1941. 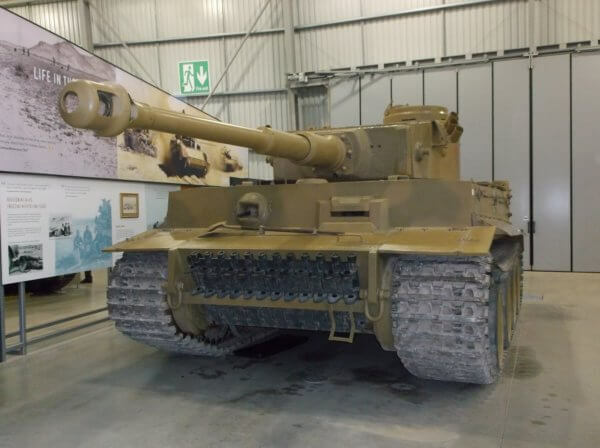 The Tiger had significantly increased firepower and armour compared to previous vehicles, which led to a dramatic increase in weight to 54 tonnes. This increased weight put a great deal of strain on the automotive components, leading to an increased rate of breakdowns. The 88mm gun already had a fearsome reputation among Allied tank crews, and the combination of that gun with thick armour (100-120mm at the front) led to the Tiger being feared and respected. The Sherman’s 75mm gun could not penetrate the Tiger’s frontal armour at any range, and could only penetrate the side armour from 100m. The 17 pounder-armed Sherman Firefly, however, could penetrate the frontal armour at 1,000m range. 1,347 Tigers were built (by comparison, over 8,500 Panzer IV and around 6,000 Panthers were produced), but the Tiger’s impact on those who encountered it was out of all proportion to the numbers in which it was fielded. In Western Europe, it was common for any tank sighting to be reported as a Tiger, despite the relatively low number of Tigers compared to other German tanks.